My goal is to awaken people to the magnificence of the Earth as a deeply cosmic being, sensing the ever-changing patterns and moods that lie at its divine core. The effect of people re-establishing a natural relationship with the Earth offers vast healing, and offers hope for the future, for both nature and humanity. What is my story? I was born in West London in the 50s, and hold warm memories of friendly relatively car-free streets, and open parks to play in. After grammar school and voluntary work in the mid 70s, I became one of the first students on a newly designed future-oriented science degree course entitled Human Ecology. It was a liberating, slightly dizzy period of my life where my horizons expanded fast. As the meetings and conferences with radical thinkers on physical energy resources and conservation rolled on, I started to question whether the grass-root politics of this emerging green movement would indeed solve the environmental problems of the world. I avidly read all the books on spiritual ecology that our progressive college possessed, and felt grateful for the space this afforded me to contemplate. Gradually I felt uneasy with the physical world of natural resource management that my degree was preparing me for. I sensed we were applying scientific models to nature that would serve to prolong our pattern of over-consumption, rather than learning how to co-exist with nature. Thatcherite times were preparing us to become wholesale consumers, and I felt critically aware that there was a fair degree of ungrounded thinking accompanying this trend. The overall assumption was that the Earth, as a separate entity, could survive as a bi-product of our growing consuming habits. By my early 20s I realised I had to carve a more spiritual relationship with the Earth if my soul purpose were to flourish. During the external year of studies in the late 70s I left West Yorkshire and by a series of happy “accidents” took an interesting job near Kyoto in Japan with a Shinto organization – Shintoism being the native nature–oriented religion in Japan. I also made a long film on nine Japanese Shinto and Buddhist communities that I refused to sell to the BBC at the time! The totally different way of thinking I encountered in that somewhat exotic year led to my taking another year out, where I researched my thesis on the spiritual role of the social worker in community development in rural South India. I had the great fortune to be invited to participate in this small project which has long since been recognized by the UN as one of the best small projects for developing countries. The stay was a most formative experience for my spiritual side. I learnt to meditate deeply and encounter other realms of reality through this practice. After working in various cultures for a few years I felt ready to complete my studies (multi-cultural education) and even start a family. By then I had become very involved in meditation practices, and I was convinced that the inner worlds were equally important as the outer world we moved around in. I gravitated toward what I termed spiritual geography, due to many experiences. Raising a family was my first and foremost role for many years. It exposed me to the work and philosophy of Rudolf Steiner, and we sent our children to a Steiner school for some or all of their education. I trained as a Steiner teacher, worked in a kindergarten, became a puppeteer, storyteller and ESL teacher at various periods. While they were young I practiced spiritual healing with real results. Later I taught reflexology in the community at many centres. I also studied theology although I never became a minister. I was still searching for my true role in society. It was during my children’s teenage years that I set up a niche tour business. This felt more like my soul purpose. With the encouragement of a good friendm(now deceased), I researched the Picts and the Celts in Scotland. We decided to channel all our local discoveries into creating day tours from Edinburgh, and so Celtic Trails was born. Many visitors seemed genuinely attracted to the early Celtic saints, and the Knights Templar. It seemed that such historic groups were small in number but significant in effect. They practiced the ancient art of geomancy, which is the art of sensing the land. This determined where they prayed and resided. Visiting so many sites off the beaten track on my tours in Scotland awakened in me a deep sense of the healing power of nature. I also started to decode the landscapes using my own methods. I inadvertently came across the work of William Buehler, a mystic and geomancer who lives still in Colorado. His articles had appeared in study materials of a local mystery school (now defunct) in the Highlands. William used many strange words about the Metatronic realms and the various presences. They frequent the realms where time and space, as we know it, do not exist. Unbeknown to me at the time, the sites I had chosen for my tours exactly mirrored invisible patterns he had discerned in the landscape round Edinburgh. This included many places close to Rosslyn Chapel. We began an almost daily e-mailing in the late 90s. Visitors on my tours would often experience something that dovetailed with his latest spiritual research. I taught people to dowse ley lines at sites that form part of an invisible network of ley lines that create “Metatronic” patterns, overseen by archangel Metatron. It became increasingly apparent that the Earth was a multi-levelled complex being who is able to respond to the consciousness of the humans passing through. It would make a story book in itself to explain how this two-way interconnection manifested. My itineraries meant I in effect became the first external guide to take people to Rosslyn Chapel, where I would explain how the carvings related to esoteric mysteries. I wrote two esoteric guides to the chapel as well as other books of poetry and legends. As the Da Vinci Code book and film took their grip on the media, the landscape changed in some ways. It became harder to create the space for visitors in which the outer and inner worlds could collide, as more and more man-made rules intruded at the various sites. In 2008 I came for a sabbatical to Ireland where my parents were born. There I wrote more books on the spirituality of ley lines and nature. I stayed on longer than first intended, and in between doing some longer tours I learnt more healing modalities, and became very interested in learning how sound can be used in healing. Like my interest in sacred places, I had always been practised a little healing locally. My latest training is in Biofield tuning which is a method using tuning forks on the human body and in the nearby energy field to integrate trauma and balance you. I was one of the first to train in this in Europe. Now living on the edge of an area of outstanding natural beauty in the west of Ireland, I combine these interests when I visit sites. I tune in with my tuning forks before toning with the energies that resonated with each place. I also use my special gong as this is such a healing instrument. Sound helps you tune into the resonance of a site. It brings you into the here and now. 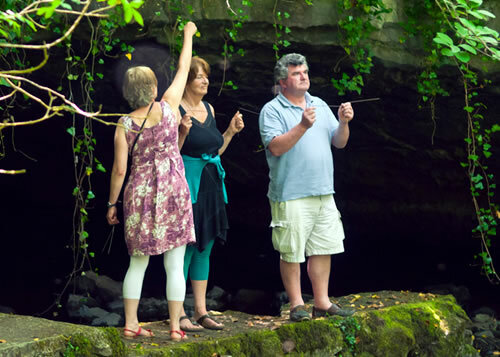 Dowsing also helps you link into the specific energetic imprints of a site. Our energetic bodies both reflect and respond to the energetic bodies of the Earth. Can you spot the aura round my head on the left as I am dowse? 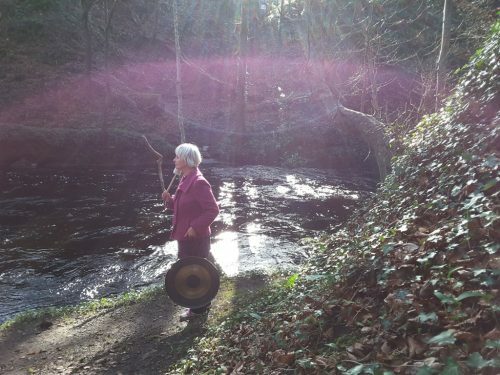 Often the most magnificent lights appear when I play my gong in nature. It is possible to rapidly expand your energy body by simple exercises performed outside in tune with nature. My tours and workshops facilitate people to have their own experience at the sites. Marko’s style of delivery is similar. He allows people to experience the mystery and power of these life-affirming exercises, always in their own way, in freedom. I find a profound simplicity in Gaia Touch exercises that enable people to feel the Earth as a divine, multi-levelled presence within them. 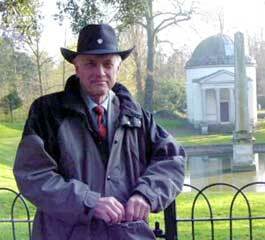 I feel I met a kindred spirit in Marko, whose dedicatory research and work with Gaia began many decades ago. To my delight he invited me to work with him in 2015 in Ireland and Scotland as his assistant and guide respectively. I decided it was time to launch Earthwise, which is a composite site for the various things I do. I hope it will help people become aware of the Earth as a living cosmic being. Since then I revisited the Celtic theme I wrote of in my first book in 1999, creating Celtic tree workshops. So far I have been to Nova Scotia, Ireland and UK cites. I based them on information in my latest book Reconnecting with Celtic Trees. In 2017 I led a series of Celtic festive walks that follow the Celtic Tree calendar. In 2018 I spoke on the Celtic Trees at a series of live talks. Celtic Trees hold many keys to understanding the shift taking place. I view this talk as an ignition key for an online series I am creating in Earth Wisdom. You may book a private tour, biofield tuning, join a webinar or workshop, or read one of my books. Please contact me with your interests!